During the 1979 revolution, Iranians from all walks of life, whether Muslim, Jewish, Christian, socialist, or atheist, fought side-by-side to end one tyrannical regime, only to find themselves in the clutches of another. When Khomeini came to power, freedom of the press was eliminated, religious tolerance disappeared, women’s rights narrowed to fit within a conservative interpretation of the Quran, and non-Islamic music and literature were banned. Poets, writers, and artists were driven deep underground and, in many cases, out of the country altogether. 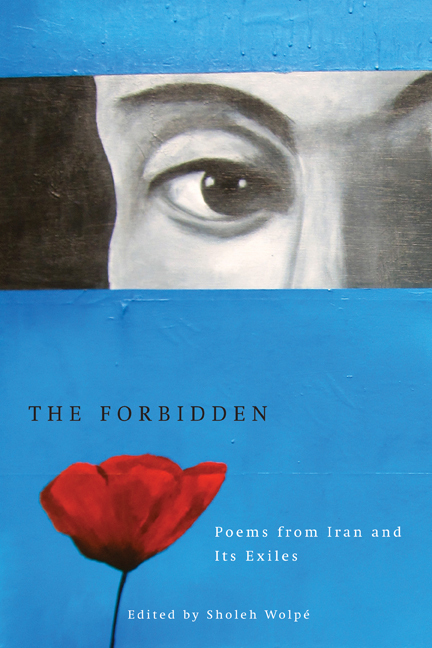 This moving anthology is a testament to both the centuries-old tradition of Persian poetry and the enduring will of the Iranian people to resist injustice. The poems selected for this collection represent the young, the old, and the ancient. They are written by poets who call or have called Iran home, many of whom have become part of a diverse and thriving diaspora. Born in Iran, and now an American citizen, Sholeh Wolp\u00e9 is an award-winning poet, literary translator, and writer. "These poems put a very human face on a people, country, and culture often deeply misunderstood in the West while reminding us once again that poetry embraces and illuminates our deepest human bonds and hopes. They are a most welcome gift." "Red marks a state of emergency in the state of the heart. This collection powerfully testifies to the emergency in beloved Iran. Every human, no matter culture or nation, has a heart. Every culture and nation has a heart. We here on this small earth share a heart. Poets are the heart’s singers. Iran’s singers call out from the kitchen tables, prisons, streets, and homelands. What demon can withstand against these beautiful and truthful singers? What heart will not open when they hear these poems?"